1/2" full or part circle heavy-duty plastic impact sprinkler head. 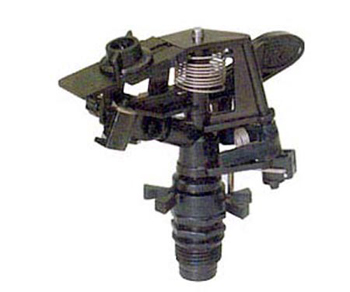 Economical impulse head, made of durable delrin. Anti-backsplash drive arm. Has stream break-up diffuser in 1/2" male bottom pipe thread. Adjustable deflector plate. 20-340 degree arc or full circle operation. Pressure: 25-60 PSI Flow: 3.54-5.64 GPM. Radius: 34'-47'.